DR Hajia Sharifatu Abukari, headmistress of Suhum Islamic Girls Senior High School in the Eastern Region, is pleading with the government to assist in the completion of some standstill projects in the school. She said the school had been pivotal in Islamic education at Suhum and its environs but it lacks basic amenities to make it grow as expected. 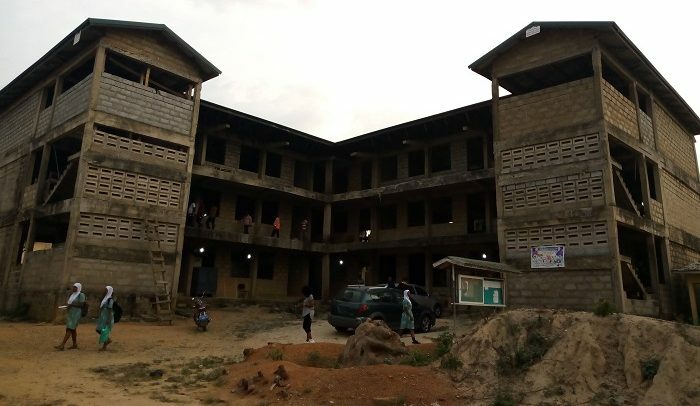 Dr. Abukari made these known when the Member of Parliament (MP) for Suhum Constituency, Fredrick Opare-Ansah, last Friday supported the school with a cheque of GH¢10,000 towards the completion of an 18-unit classroom project which is at a standstill. The headmistress in the company of the Municipal Director of Education, Mrs. Esther Quaye-Sowah, who received the cheque, expressed her gratitude to the MP. The headmistress said the school which is 20 years old has a population of about 2,000 students, saying they could have done more but for the lack of basic infrastructure. “Now I have a population of about 2,000 students as compared to the initial 36 students and this clearly shows I’m doing well, but I know if we have better facilities we shall come on top,” she indicated. She disclosed there are not enough vehicles for their operations. Mrs. Quaye-Sowah admonished the students to take their studies seriously so that the efforts of government and others towards education do not go to waste. After his presentation, Mr. Opare-Ansah lauded the headmistress of the school for her effort to raise the standard of the school in spite of resource constraints. “This is not the first time we are doing something like this. Even at the time we were in opposition, Dr. Bawumia, the current Vice President, gave them building materials worth about GH¢30, 000. We normally visit them with the idea of supporting the school,” he revealed.